The city of Groningen was founded already in the eleventh century on the site of two old farming villages. The location of the city is not an accident. Groningen is strategically situated on the northernmost part of the Hondsrug, on the transition of from sand to clay and flanked by nearly inaccessible peat bogs. That meant that the inhabitants were relatively safe both from high water and from invaders. The location at the point where sand became clay, and close to the Drentsche Aa river, was also extremely favorable for trade. 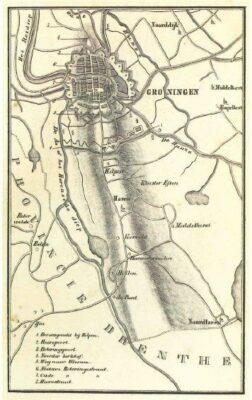 The Hondsrug has always played an important role in the development of the city of Groningen and the region around the Hondsrug village of Haren. Much of the local (prehistoric) history is still visible in the landscape: an attractive setting for a ‘prehistoric cycle ride’ from the Grote Markt in the city centre to the hunebeds in Noord- and Midlaren. The Hondsrug region to the south of the city of Groningen is characterised by four dead straight ridges which originated in the last but one ice age (Saalian). The most easterly and most prominent ridge is the Hondsrug, which runs for 70 kilometres from Groningen to Emmen. The Hondsrug region is the first Geopark in the Netherlands and was designated in 2015 as UNESCO Global Geopark De Hondsrug. The formation of the Hondsrug ridge began about 150,000 years ago during the Saalian Ice Age, when an enormous ice sheet pushed its way across the landscape. Meltwater and ice pushed and kneaded the land between Coevorden and Groningen, creating a number of parallel hilly ridges which remained clearly visible after all the ice had melted. People have lived and travelled on the Hondsrug for thousands of years. Once it was the only place in the region where people could live high and dry, at a safe distance from the peat bogs and the sea. Visible reminders of the time are the hunebeds and burial chambers which were built around 5,500 years ago. This cycle ride of about 44 kilometres starts and ends on the Grote Markt in the heart of Groningen and mainly follows the numbered cycle network called ‘knooppunten’. Variations from this are given in the text. A leaflet with a detailed description of the route is available from the VVV tourist office in Groningen and from the Hunebedcentrum in Borger. The Hondsrug runs from Klazienaveen in the south via Emmen, Gieten and Zuidlaren to a point north of the city of Groningen. In the south the sandy ridge is 25 metres high in places, and even in the city it reaches a height of 9 metres above sea level. The location of the city is not an accident, for Groningen lies on the northernmost tip of the Hondsrug, where the transition of the from sandy soil to clay is flanked by nearly inaccessible peat bogs. That meant that the inhabitants felt relatively safe both from high water and from invaders. The location at the point where sand became clay, and close to the Drentsche Aa river, was also extremely favourable for trade, giving it acess to the sea. In shopping streets such as the Herestraat to the south of the Grote Markt the most northerly ridge of the Hondsrug is still clearly visible. The side street at the highest point is actually called the Hoogstraatje or High Street. The slope is also easy to see in the adjoining streets. From this point the slope gently down in a northerly and easterly direction towards the Ommelanden, the rich coastal lands north of the city. The hunebed builders made earthenware pots in a characteristic shape which you rarely see anywhere else: a beaker with a neck in the shape of a funnel. The groups of people who made these funnel beakers were therefore called the Funnel Beaker People. The people of the Funnel Beaker Culture built their grave monuments on, the hunebeds, on the sandy ridges of the Northern Netherlands, especially the Hondsrug. The people of the Funnel Beaker Culture were the first farmers in this area. On the spot where you are now standing, by the Van Julsinghastraat and the Oude Winschoterdiep, remains have been found of a field complex belonging to the Funnel Beaker Culture dating from around 4,500 years. BC. You have just ridden over part of the Esserweg. This road crosses the Hondsrug on the border between Groningen and Haren. On this border the Hondsrug is no wider than 500 metres. The Esserweg is a so-called ‘hollow road’, an old track carved out by erosion and intensive use. At this point the road lies between two slopes. The convent of Yesse, which belonged to the Cistercian order, was founded in Essen in 1215. During wetter periods this spot could hardly be reached. And that is exactly why the Cistercians chose this location: here they were disturbed as little as possible. The Yesse convent existed until 1594. Today only a few remains of the surrounding ditch can still be seen. At Essen 7 you can find a visitors centre open every second Saturday of the month, see www.kloosteryesse.nl. The Hortus is one of the oldest botanical gardens in the Netherlands. In total the Hortus consists of twenty hectares of very varied gardens. These include a wild plant garden, a Celtic garden and a Chinese garden with an authentic Chinese teahouse. A Hondsrug Garden has recently been added. The Hortus organises regular activities and exhibitions and is open every day throughout the year, see www.hortusharen.nl. The main road called the Rijksstraatweg has for centuries been the main southern approach to Groningen. The ancient route over the Hondsrug runs from Coevorden as far as the Grote Markt of Groningen. The Rijksstraatweg boasts magnificent villas, built on the firm sandy soil of the Hondsrug. On the square in the centre of Haren, behind the café, stands a very large boulder. This stone represents the many erratic boulders in the region and the history of the landscape. Just think: these stones originally came all the way from Scandinavia and were pushed here by the ice about 150,000 years ago. The Bartholomeüs church in Noordlaren looks out onto the Hunze valley to the east of the Hondsrug. The little harbour links Noordlaren with the Zuidlaardermeer lake which lies in this valley. The ancient stream valley of the Hunze river originated at the time when the ice sheets melted after the last but one Ice Age. The valley was carved out by the melt water. For a long time the Hunze river was no longer recognisable as a natural stream because it had been transformed into a canal, following the peat digging and land redistribution. Over the last twenty years many different organisations have worked together to re-develop nature in the Hunze catchment area and restore the meandering stream. In the reception building of the bungalow park ‘Waterpark De Bloemert’ is a free exhibition about ‘Water’, one of the Expedition Gateways of Geopark de Hondsrug. The expedition tells the story of water in the Hondsrug region, from ice and melt water, via bogs and streams to springs and drinking water. This “Geopark de Hondsrug” story is visually exciting and is definitely worth a visit! The Zuidlaardermeer lake was created between the 10th and 12th century by interaction between the peat growing in the area and the ebb and flood of the Hunze river which at that time was still a tidal river. The high water constantly wore away bits of the peat, until a lake had been formed. Hunebeds were built about 5,500 years ago in the last phase of the Stone Age. They are the oldest monuments in the Netherlands. They were built from the erratic boulders pushed here by the ice sheets during the Ice Ages. Hunebeds were used as burial chambers. The bones of the deceased have disappeared but some of the grave goods have been preserved, such as earthenware pots, amber jewellery and tools and weapons made of stone. The hunebeds numbered D3 and D4, next to Schutsweg 42, are almost complete. They are also unique as they lie end to end, one behind the other. In fact they were formerly regarded as one single hunebed. In 1870 the burial chamber was excavated and part of the finds are now in the collection of the Drents Museum in Assen. In Noordlaren stands the most northerly hunebed on the Hondsrug: the only hunebed in the province of Groningen. Officially known as G1, the hunebed is colloquially known as Hunebed ’t Heiveen. The first written record of this hunebed dates from 1694. Another source of information is an article by Jetzo Boeles in the Groningsche Volksalmanak of 1845. Here he describes how an old inhabitant once told his father about the hunebed being excavated, probably around 1750. Apparently bones, urns containing ash, and a carved black stone hammer were found. Powder holes at the top of the stone (on the left at the back and on the right at the front) mark the attempts to blow up the hunebed sometime around 1800. The culprits wanted to sell the rubble as building materials. Fortunately they were caught and the destruction of the rest of the hunebed was prevented just in time. Today hunebeds are protected by law. The Noordlaarderbos is a varied woodland managed by the Natural Monuments organisation. Even in prehistory this woodland formed a link in the route over the Hondsrug between Coevorden and Groningen. For centuries this area was heathland, before being transformed partly into sand drifts by heavy traffic. The cart tracks can still be seen here and there. There are also burial mounds which are at least 2,500 years old. Close to the building called “Natuurvriendenhuis De Hondsrug” lies the Holy Hill or Gallows Hill (de Galgenberg), a natural pulpit or perhaps a place of execution. The Noordlaarderbos is home to many bird species, such as the oriole, nightingale, owls, sparrowhawks and goshawks. With a bit of luck you might see a deer, fox, ermine or stone marten here. The Besloten Venen (enclosed fens) are a remarkable link between the Drentsche Aa river on the west of the Hondsrug and the Hunze river to the east. It is a ‘water break-through gap’, an opening carved by flowing melt water breaking through the sandy ridge. There are only two such ‘water gaps’ in the whole Hondsrug region; the other is near Borger in Drenthe. ‘Water gaps’ were formed in the ice ages when water under the kilometres thick ice sheet melted and began to flow. In the last Ice Age erosion caused both valleys to join to form this unusual gap through the Hondsrug. After the last Ice Age the Besloten Venen became a stream valley, draining water from the valley of the Drentsche Aa towards the Hunze valley. To the north of the Sassenhein lake, in the valley on the west of the Hondsrug, lies Wolddeelen area, where lakes or fens such as Sassenhein formed as a result of peat-digging. After the excavation of peat ended, around 1900, these lakes became popular for fishing. The fishpond, the pavilion, the staff building and a statue are national monuments and there is now a café in the pavilion. Remains of an early Palaeolithic encampment were found close by. Also the Paterswoldsemeer was formed as a result of peat digging in the 18th and 19th century. The lake is in a low-lying area to the west of the Hondsrug: the stream valley of the Drentsche Aa. The Drentsche Aa consists of a collection of little streams and brooks in the north of Drenthe which join together near Schipborg into one single river. The last part of this cycle ride follows this river until it flows out into the canals around the inner city of Groningen. From there the Aa becomes the Reitdiep which used to flow to the Lauwersmeer. From the Hoornsedijk, the small dike on which you are now riding, you have a good view of the river winding through the landscape. Groningen arose on the banks of a Drenthe stream. The Drentsche Aa rubs along the west flank of the Hondsrug and then flowed on to the sea as the Reitdiep. In the Middle Ages the oldest harbour quarter of the city lay here, on what is now called the Hoge der A (Higher) and the Lage der A (Lower). Because of the tides it was useful to have a higher and a lower wharf, and the high wharf lay against the flank of the Hondsrug. The rising of the west flank of the Hondsrug is clearly visible in the Brugstraat. From the Market Square cycle into the Gelkingestraat to the right of the Drie Gezusters pub. At the end of the street go left into the Herebinnensingel. Take the first turning right. After the Saint Jozef Cathedral go left into the Radesingel to cycle point 88. Cycle towards 82. Continue towards cycle point 82, but before the viaduct over the Winschoterdiep turn right into the Meeuwerderbaan. Cross the railway and turn immediately left to cycle towards 81. Then continue towards 75, but after the red cycle path (Esserhaag) go left on the Esserweg until you reach Essen. Cycle clockwise through the hamlet of Jesse and exit it onto the long, unpaved road. Go left at Kerklaan and follow this to the Hortus botanical garden. Continue cycling along Kerklaan. Go right into Molenweg, and then left at the roundabout. Go left into the Julianalaan. Cycle via knooppunt numbers 75, 77 and 86 to 59. After 59 cycle straight ahead to 54. If you prefer the shorter version, cycle to 86 and then via 83 and 84 towards 27. Go left at the Sassenhein lake and pick up the regular route from the description at point 13. Cycle on towards cycle point 55. Continue a short distance towards the water to view the Zuidlaardermeer lake. Return and continue via cycle point 55 towards 53, but then immediately take the first cycle path on the right: the Hunebedpad. Go left on the Schutsweg towards the hunebeds of Midlaren. Turn around and follow the Schutsweg north. Go left on the unpaved road past the hunebed. Keep right to the woodland of Noordlaarderbos. Follow the Duinweg, but go left at the Pollseweg. Follow the route in the direction of cycle point 87. Cycle via cycle point 87 towards 57. Go towards 59, but go straight ahead on the Hoge Hereweg. Then cycle via 84 in the direction of 27. At Sassenhein go left. Turn right across the bridge into Brugstraat. Cycle via the Vismarkt back to the Grote Markt.